Are you a Halloween lover? Can’t get enough of scary movies, ghost stories, and treats? If this sounds like you, then you need to visit Salem, Massachusetts this Halloween or really any time throughout October. This town fully embraces their haunt-soaked history. Salem is a New England town along the Massachusetts north shore and it’s the home of the 1692 witch trials when 20 people were hung for being suspected of witchcraft. 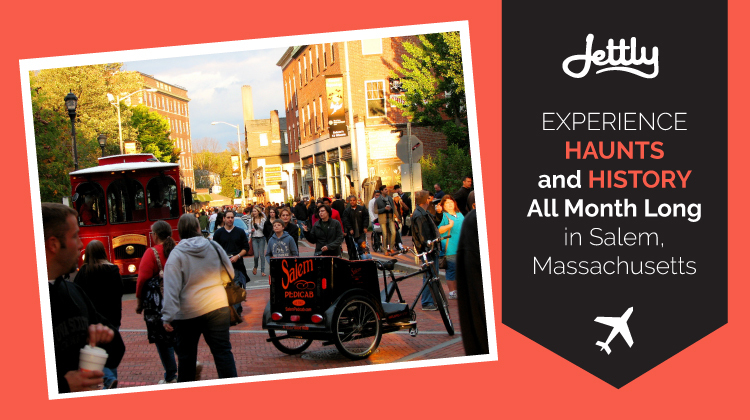 Each year, over 250,000 people visit Salem for its Halloween celebrations. The costume balls, ghost tours, haunted houses, museums, theatrical presentations, and so much more make Salem’s Haunted Happenings a top 100 ABA event. If you’re looking to stay in Salem, you have three options: the Hawthorne Hotel, Salem Waterfront Hotels & Suites, and the Clipper Ship Inn. Constructed in 1925, the Hawthorne is a proud member of the Historic Hotels of America. 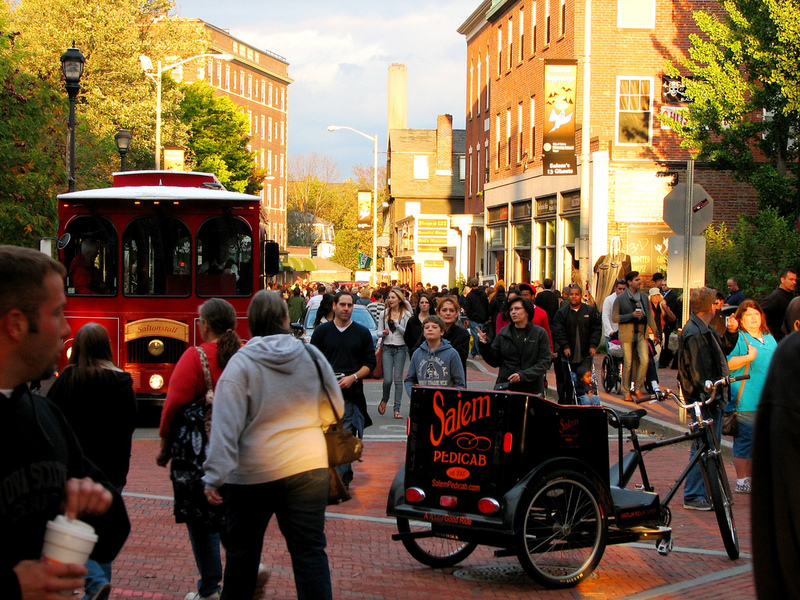 When it comes to food, Salem MA has no shortage of dining options. No matter what you’re in the mood for, they’ve got you covered. Enjoy BBQ, Thai, Mexican, pizza, fine dining, and, of course, world-class fresh seafood. Dining in the Dark promises to offer one of the most unique dinners you’ll ever experience. Blindfolded, you’ll sample tastes, sounds, smells, and textures to guess what’s on your plate. In the weeks leading up to Halloween, there’s plenty to enjoy for every member of the family. Salem is home to a number of historical museums and tours that are also available throughout the rest of the year. During October, however, the city comes alive with festive activities and seasonal events. Wicked Wednesdays are new for the 2017 season. Designed for the 12 and under crowd, kids can experience walking tours, music, and interactive events. For something more hands-on, kids can enjoy craft night at the Salem Maritime National Historical Site. Each Saturday evening, family-friendly events such as rides and movies are available throughout the Salem Commons for kids of all ages. Who doesn’t love magic?! Evan Northrop leads hour-long magic presentations throughout the month to mystify the audience with folktales, fantasy, and the art of illusion. Explore centuries of history from Salem’s founding in 1626 onwards to the thriving city it is today. You’ll learn about the witch trials, American Revolution, and Salem’s role in the great Age of Sail. The great thing about Salem, Massachusetts is the wide variety of activities available to people of all ages. 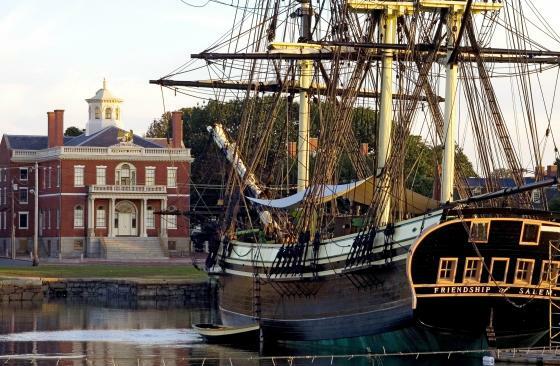 Start the morning with a guided coffee walk during which you’ll learn about Salem, MA’s illustrious history including the spice trade, landmarks, dynamic culture, and so much more. Adults can enjoy Wicked Wine-Down Wednesdays for spooky Halloween-themed wine tasting. Soak up history through a romantic candle-lit ghostly walking tour past haunted houses, historical architecture, and ghost photography hot spots. Get your costume ready for the weekly Mahi Mahi Halloween Boo!s Cruise where you’ll mingle with friends old and new, compete for cash and prizes, and sip hard cider under the stars. Get ready for Journey of Souls and Spirits to Forever: The Temple of Nine Wells 26th Annual Samhain Magick Circle. Witches from all over the world travel to Salem on Halloween for this event to honor spiritual ancestors and all those who have passed before us. If you aren’t feeling quite up to a spiritual ritual, head over to the Derby Street Carnival for some food, rides, and games. Enjoy a lantern-lit stroll with Salem’s highly-acclaimed Haunted Footsteps Ghost Tour. You’ll pass through cemeteries and learn about local paranormal activity. For something more low-key, kick back on the waterfront with a cash bar, appetizers, dancing, and music. Halloween in Salem, MA wouldn’t be complete without the live music, trick-or-treating at the historic Phillip’s House, and Halloween finale fireworks! At Jettly, we offer flights all around the world for one flat rate: no extra fees or hidden charges. You still get to choose from all the same aircraft and flights but for a much lower price. Skip the hassle of commercial air travel and fly privately on a luxury jet. Submit a flight request with Jettly today!